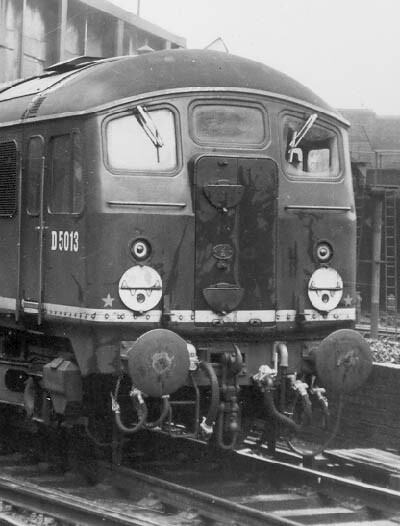 For a number of the larger orders for diesel locomotives under the 1955 Modernisation Plan, the length of the production runs were such that changes to the original cab designs occurred due to enhancements & alterations instituted by the builders and changes mandated by British Railways. 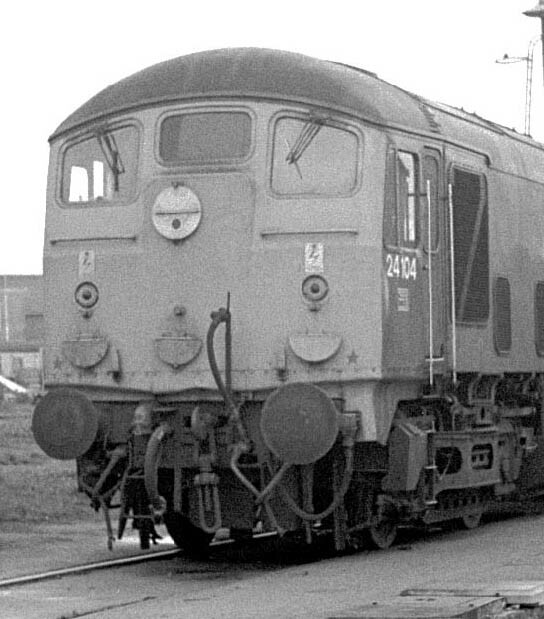 The Class 24/25's had one of the longer production runs and did feature a number of changes. 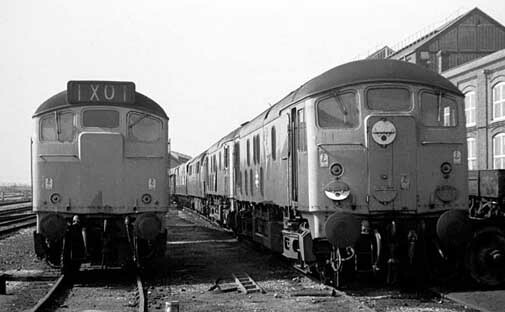 The Class 24's were built at Derby, Crewe & Darlington and received major repairs at Derby, Crewe, Darlington, Doncaster, Stratford, Eastleigh, Glasgow & Inverurie, naturally there was bound to be differences in the way the Workshops did things, particularly involving accident repairs and at the time of major overhauls. (Photo credits are using initials with index at bottom of page, uncredited views are mine). The first Class 24's left Derby and Crewe with cab design similar to the view above of D5004 (U). The influence of British Railways current operating practice featured train identification with four position folding circular discs and the fitting of gangway doors to allow movement of the crew between locomotives. This basic design would cover the locomotives D5000 - D5113 (24001 - 24113). The view of D5004 is prior to any type of yellow warning panel being added, though an electrification flash has been affixed to the front. The position of these flashes was not consistant. The locomotive also sports two brackets for carrying a headboard, a feature found only on the early machines. The position of the number and builders plate is standard. 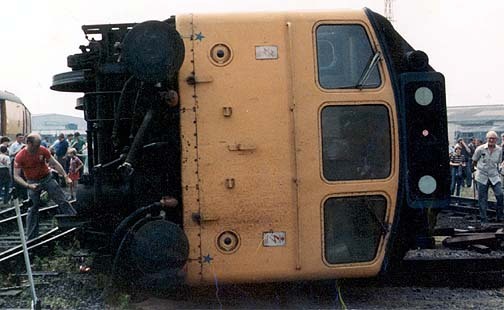 The ventilator above the cab door opening is standard, though the split frost screen and Athermos style axle box were both features only carried by the early build. Also standard is the cab side droplight window. The positioning of the steam style shed plate varied from region to region, here it is mounted under the builders plate. 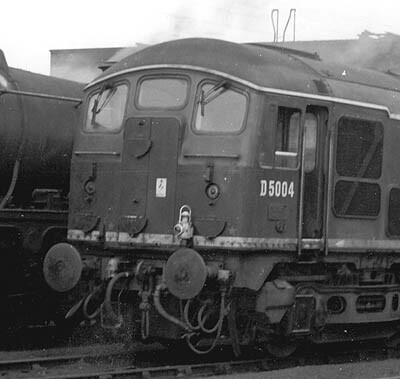 Also from the first production series is this view of D5013 (RC). The electrfication flashes have not yet been added and this locomotive does not have the two headboard brackets. Darlington Works also received an allotment of Class 24's, this view features D5098 (U) from early in Darlington's production run. The steam style shed plate is carried on the front and a small yellow warning panel has been added. There were quite a few variations in how this panel was painted, this one has the rounded upper corners. At some point in the production run of the Class 24's British Railways altered the way that train identification would be carried out in the future. The former method of using four discs was replaced by a four position alpha-numeric display housed in what became known as headcode boxes. This had quite an impact on the design of the cab front. The removal of the discs and their associated lights certainly cleaned up the lower part of the cab front, but this was offset by the rather un-imaginative positioning of the headcode box in the center of the cab roof. This change was effective from the production of D5114 through D5175 (24114 - 24150, 25001 - 25025). The first of the modified Class 24's came out of Derby during 1960 destined for the Scottish Region, particularly for working out of Inverness on the Far North, Kyle and Highland lines. The two views above of D5116 (both MM) show the locomotive in 1960, just out of Derby and in 1969, now with a coat of blue paint and full yellow ends. These locomotives also featured a recess under the drivers window for the fitting of tablet catcher equipment. This resulted in the number and builders plate being placed at the 'wrong' end of the locomotive. Additionally the droplight window on the driver's side was altered to a sliding window, since the tablet catcher recess used the space normally occupied by the open window. Three piece snowploughs were also fitted to the Inverness allocated machines. In the 1969 view an attempt has been made to seal the gangway doors by placing metal strips around the gaps, this was done to a number of locomotives prior to the complete reskinning of this area when the locomotives went through a major overhaul. 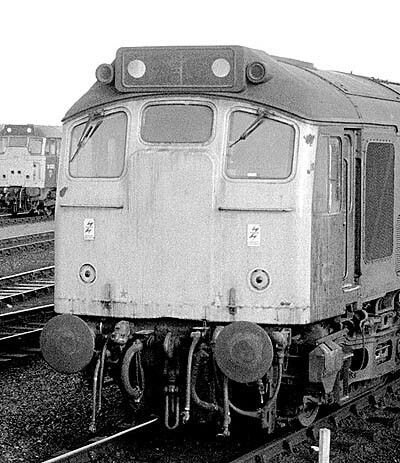 Apparently the "Derbys" as the Class 24's were known at Inverness were considered to have more draughty cabs than the "Birminghams" - the Class 26's from the BRCW factory. Modifications have also been made to the boiler room, the grille is now covered by your standard blanking plate, but unique to Inverness this has been perforated with five holes to allow for at least some airflow. Additionally the roof mounted ventilation has been minimised, a flush roof panel replacing the raised hood. Twin sealed been headlights have also been added and the frame level skirting to the left of the cab door is now removed. 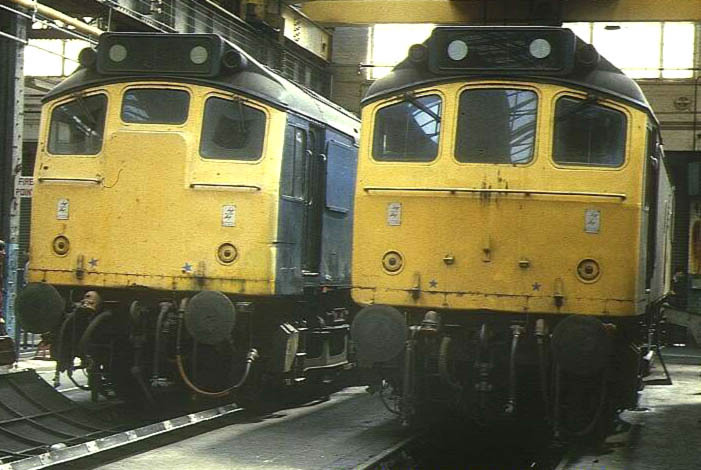 The transition from the Class 24 build to the Class 25 build was more of an internal nature than external, particularly with the uprated 6LDA28 power unit. From the above views of a D5148 (U) (Class 24/1) and D5157 (RC) (Class 25/0) there appear to be no detail differences. Following on from the transitional Class 25/0 was the Class 25/1 (and later Class 25/2 & 3). 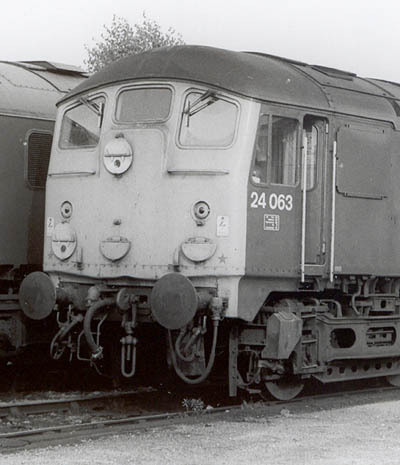 Since the delivery of the first of the Class 24's these locomotives had been overweight and throughout the build changes had been made to reduce where possible the locomotive weight. 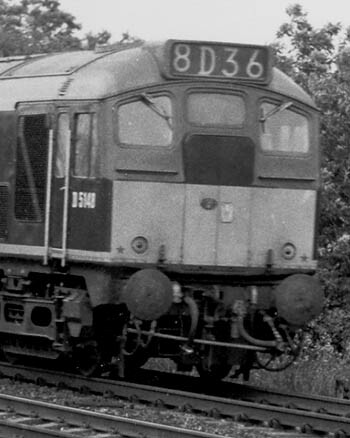 The use of the lightweight 253AY traction motors in the class 25/1's was enough of a weight saving to avoid further design changes related to the axle loading. 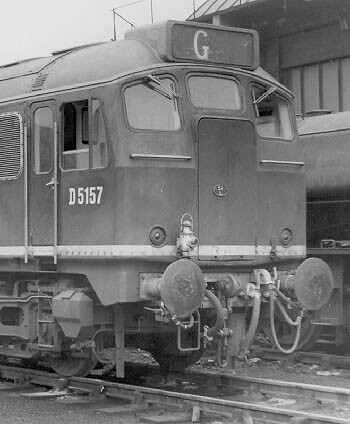 Although the fundamental shape of the cab was unchanged there were a number of differences between the Class 25/0 & Class 25/1. In the view above of D5188 (TT) the horns were removed from the buffer beam area to circular receptacles either side of the headcode box. 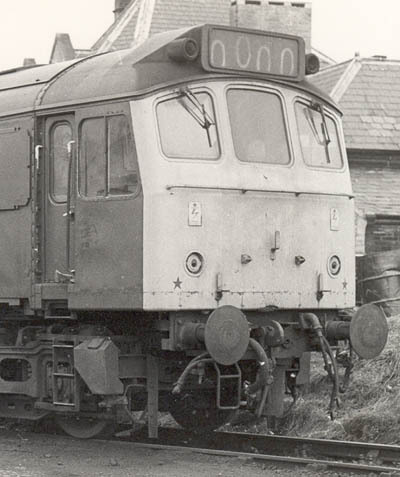 Also changed was the skirt along the bodyside, the 'design styling' of the Class 24's was done away with apart from a modest wrapping round of the sheeting at frame level around the cab. 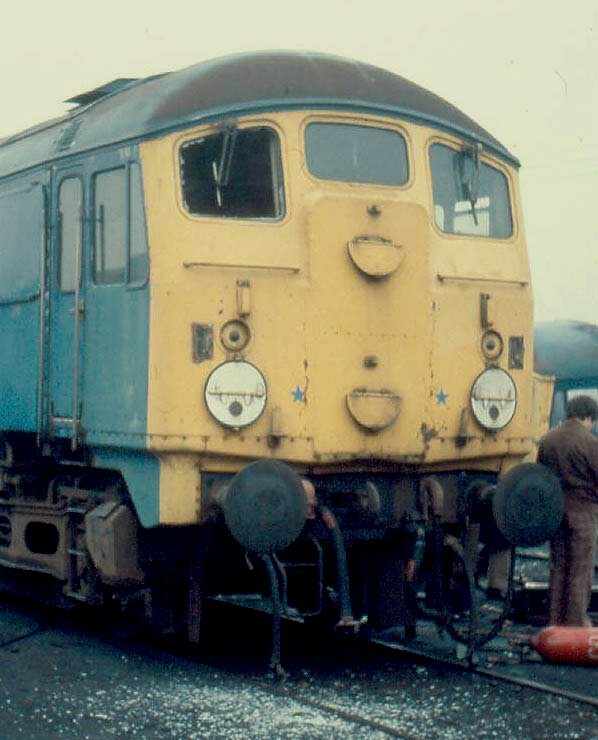 The frame line was now a straight line across the cab front, on the Class 24's there was a slight lowering of the line beneath the gangway doors. The design of the cab doors was also changed, the flush mounting of the Class 24's gave way to a recessed doorway for the Class 25/1's. This also affected the handrails with the Class 25/1's incorporating the handrails partly into the door recess. The neat flush fitting of the gangway doors was now marred by the external hinges and the repositioning of several brackets. The design of the bogie mounted sandboxes was also changed. 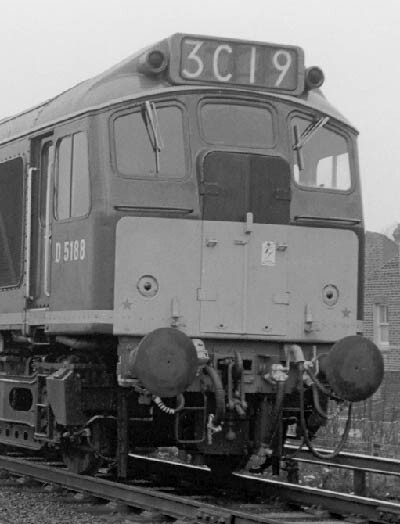 Because of the long production run of the Class 25's and following the differences noted in the operation of the Inverness based Class 24 as compared to the Class 26's the opportunity was taken to update the bodyshell of the Class 25. Two areas received close attention in the redesign. Primarily the air filters were removed from the bodysides to the cantrail, allowing for a much cleaner looking bodyside. Secondly the requirement for the fitting of gangway doors had been removed so the opportunity was taken to redesign the cab front. 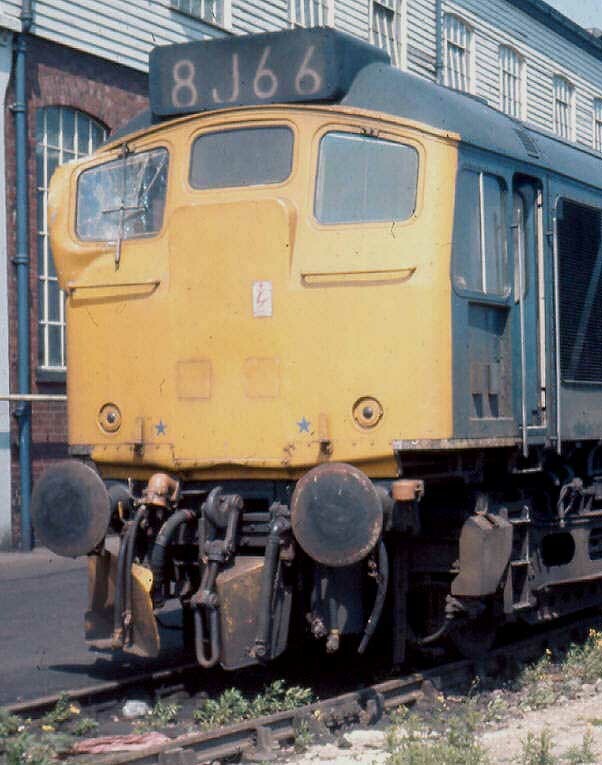 For the Class 25 this led to a much larger center cab window and generally a tidier looking cab front as seen above with 25133 (U). The handrail now stretched continuously across the cab front whilst two headboard brackets and a lamp bracket were positioned towards the center of the cab front at the same level as the marker lights. Generally two electrification flashes adorned the cab front, usually positioned above the marker lights. With this redesign the evolution of the Class 24/25 cab as built by the Workshops came to an end. However the story does not quite end here as the locomotives lasted long enough in service for a number of service modifications to be made. Perhaps the most obvious modification/improvement was the sheeting over of the gangway doors as the locomotives went through major overhauls. This cut down on the draftiness in the cabs and miminised the number of places where rain & snow might infiltrate the cab. Seen above with 24063 (RC) is the result of Derby Works resheeting the cab front to do away with the gangway doors. 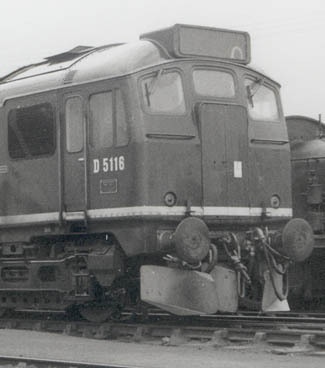 One minor detail between the Workshops is that upon reskinning the cab front Derby would place the center discs where the left hand gangway door had been (as seen from the photographer's perspective), at Glasgow the center discs would be placed on the cabs centerline, giving a more balanced look. This locomotive has the typical pair of electrification flashes, has had the boiler grille replaced with a solid blanking plate and no longer sports a ventilation grille above the cab door. The builders plate is missing, these were sometimes refitted onto the driver's side door, but it was easier to remove when placed here rather than on the driver's cab side panel, since this was double skinned. 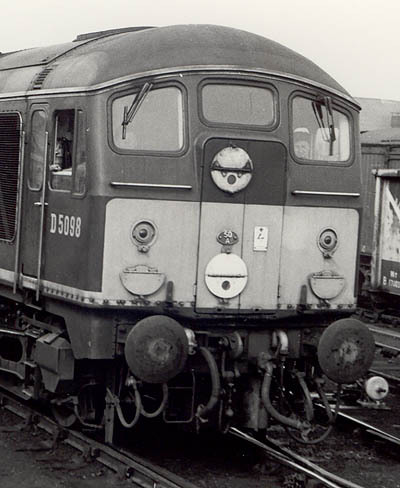 The resheeting of the Class 25's generally led to a much tidier appearance for the cab front, particularly as the headboard brackets and the center lamp iron were frequently never replaced. In this view of 25037 (TS) the blue star coupling code, normally found towards the cab corners at frame level are inboard of the lamp irons. The locomotive number is behind the radiator grille suggesting its last repair was at Glasgow. Four bolts and a shadow on the cabside indicate the former location of the builders plate. 24007 at the end of its days, it still carries the headboard brackets, has black rimmed discs and has its center discs centred on the cab front in true Glasgow fashion. 24046 (TS) was one of those Class 24's not to have the gangway doors sheeted over, the left hand disc (in the closed position) has been set wrongly, there are three electrification flashes and the ventilator over the cab door has been removed. 24049 (NP) has a pretty much standard cab except for the acquisition of a headcode box from a Class 24/1! 24090 (NP) was one of three Class 24's to reach 1975 still in green livery. Looking somewhat faded here with an interesting patch over the driver's side window. The gangway doors are still intact. The builders plate had been moved to the driver's door but has since disappeared. 24090's last major overhaul and repaint was at Derby in 1969/70. 24104 (TS) was one of the former Gateshead allocated locomotives used on the Tyne Dock - Consett trains. The cab is pretty much standard apart from the retention of the additional airpipe used for the operation of the wagon doors on the iron ore trains. Some of the Class 24's carried these no longer used connections until withdrawn. 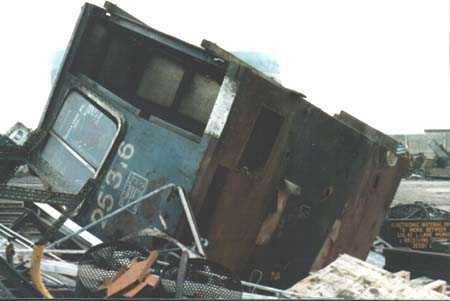 24117 reveals its final condition prior to scrapping. The empty tablet catcher recess still holds the mounting brackets & the sliding driver's side window is visible. Square patches cover the location of the headlight locations. There is one electrification flash and it appears the two blue star coupling symbols are inboard of the lamp irons, which might be a Glasgow trademark. 5117 (TS) in better days, the tablet catcher is removed but the twin sealed beam headlights are still present. The Inverness style perforated boiler room blanking plate is obvious and the roof ventilation for the boiler room features the modified, lowered panel. The glass panel on the front of the headcode box is modified from the original fitting, possibly a more weather-tight version for the Highland winters. 5129 (KH) reveals an attempt at draught-proofing the gangway doors, with metal strips along the seams. 25027 (PM)stands withdrawn at Saltley. The position of the headboard brackets and the upper lamp iron is a little unusual. 25034 & 25286 stand inside Derby Works in June 1984. In reskinning the cab front of 25034 the headboard brackets and top lamp iron have been removed. The blue star coupling stencils are in the Glasgow position, as they are on 25286. Although three years separate the build dates on these locomotives the similarities remain obvious. Derby & Glasgow were responsible for sheeting over the gangway doors as the locomotives came through the Workshops. Glasgow (and/or Inverness) had already implemented a stopgap measure on the Inverness allocated locomotives by the addition of metal weatherproofing strips to all the seams on the gangway doors. It is uncertain when the first locomotives underwent the complete removal of the gangway doors, but most likely occurred during 1969/1970. 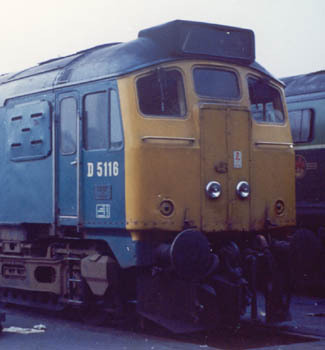 Glasgow appears to have been very enthusiastic in carrying out the modification, Derby were more conservative in making the modification, though it was being applied to the final Class 24's as they went through Derby Works in 1975. It is interesting to note that in the list below are also the last three Class 24's to remain in green livery (24090, 24092, 24137). Photograph courtesy collection of Railphotoprints. Its March 25th 1976 at Swindon Works as 24146 and 24041 await their turn to be processed through the Workshops as part of the scrapping process. The head-on view highlights the changes carried out to the cabfronts as design changes and modifications/improvements took place over the years. 24041 presents the cluttered appearance of the early class members, with gangway doors, disc indicators, electrification flashes and other oddments. 24146 shows the cleaned up image, the roof mounted headcode display did away with the disc indicators and their lights, at some point the gangway doors were sheeted over, the electrification flashes are neatly placed and any surplus lampirons have been removed. The cabs of 25139 & 25256 wait outside Vic Berry's yard in Leicester, after having made the trip from Swindon Works on the back of a lorry. Vic Berry had obtained the contract to clear Swindon of those machines left intact but still awaiting scrapping, following the closure of the Works in March 1986. A number of cabs were found to contain asbestos so they were carted off to Leicester for final processing. Like a number of other condemned machines 25256 did not go quietly. Withdrawn from Crewe in April 1985 the locomotive was stored there until January 24, 1986 when, along with 25054 & 25229 it was moved to Doncaster for breaking up. However two months later on March 20th 25256 & 25214 were towed down to Swindon for breaking up!! 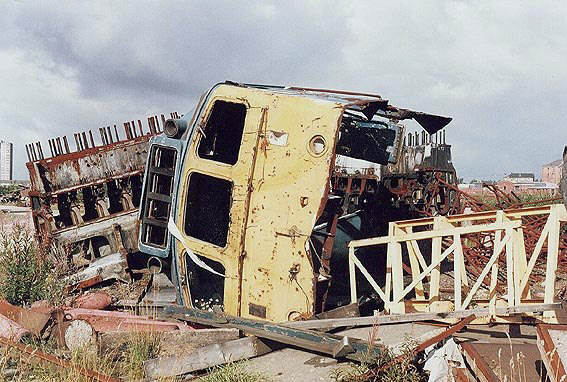 The body of 25256 was disposed of during October 1986, when the cabs were finally dismantled at Vic Berry's is not recorded. Condemned machines usually had the honour of a final trip to the scrapyard for the breaking up, some however made detours on that journey. 25177 was one such machine, withdrawn from Cricklewood late in November 1982 the locomotive eventually found its way to Temple Mills yard, Stratford for re-railing exercises. In this endeavour it was joined by the equally unfortunate 40092, withdrawn at the same time as 25177, but from Longsight depot. Shown here is 25177, its re-railing capabilities on display to the public at Stratford Open Day in 1982. By June 1984 its exercises were over, being dispatched to Swindon with 08550 & 40092, all three being quickly broken up. And from the home of the class, Derby Works, is a view depicting one of the cabs from 25316 cast out on a pile of junk. 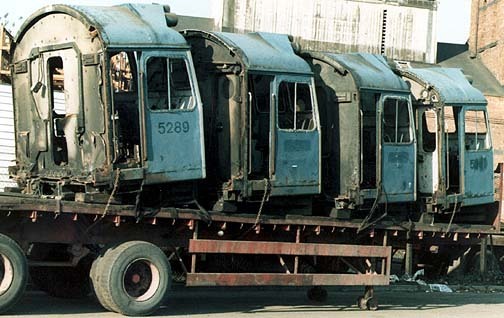 The Class 24/25 cabs could be removed from the frame/body in virtually one piece, making possible sights such as this. Presumably this is the cab that bore the brunt of the collision when 25316 & 25313 working the 00.19 Garston - Forders brickliner collided with 85022, running light at Speke Jct on May 12th 1981. Despite that fact that by this time Derby Works had set low repair limits for the Class 25's, 25316 was repaired, eventually becoming 25911. And finally a June 1986 view of a Class 25 'cab' (possibly 25108) at Gasgow Works, surrounded by power unit carcasses that no doubt once powered these fine machines.